Most women can continue working throughout their pregnancies, but many require adjustments to how or when their job is performed to be able to continue working safely. 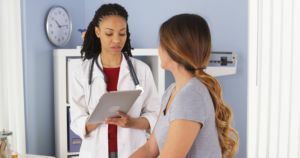 One-quarter million women are denied their work accommodation requests each year, threatening the health of those women and their pregnancies.You can play an important role in ensuring your patient receives the accommodation she needs. Healthcare providers are asked to write work accommodation notes, but typically are not trained on how to do so effectively. Well-intentioned providers may write notes that inadvertently cause their patients to be sent out on leave, lose their health insurance, or even lose their jobs. See Jackson, R. et al., “My Obstetrician Got Me Fired: How Work Notes Can Harm Pregnant Patients and What To Do about It,” Obstetrics and Gynecology, vol. 126, issue 2, p. 250-254. A team of doctors and lawyers created the tools on this site to help you write work notes that increase the likelihood that your patients will receive the pregnancy accommodations they need to continue working and earning an income. To invite an expert to present on pregnancy accommodation work notes at your healthcare institution, contact us at (415) 565-4640. This webinar trains prenatal care providers – doctors, midwives, nurses, and staff – on how to best support their pregnant patients at work. Viewers will learn about the laws that protect pregnant employees, best practices for providing guidance to pregnant patients facing workplace challenges, and specific guidelines for writing effective work notes that will increase the likelihood pregnant patients will receive work accommodations they need to maintain a healthy pregnancy. This online presentation is a reproduction of a grand rounds lecture delivered in fall 2016 at a dozen medical schools nationwide, including the University of California, Harvard, Stanford, Baylor, the University of Pennsylvania, the University of Pittsburgh, the University of Chicago, and others. To learn more about the workplace protections available to your pregnant patients, visit A Better Balance’s Babygate website, a Know Your Rights project clarifying legal protections around pregnancy discrimination, breastfeeding, family leave, and more. You may also refer your patients to the Center for WorkLife Law’s free legal hotline: hotline@worklifelaw.org or (415) 565-4640 or A Better Balance’s legal hotline: (212) 430-5982 in New York, or (615) 915-2417 in Tennessee. In California, you may contact Legal Aid Society-Employment Law Center’s Work and Family Helpline at (800) 880-8047.